I am trying to create a voltage divider circuit to off offsset two BJT input voltage is for a push pull amplifier configuration, and I am having trouble choosing the proper resistor values for my circuit. My source voltage is 12V Vcc and I need to create something like below. 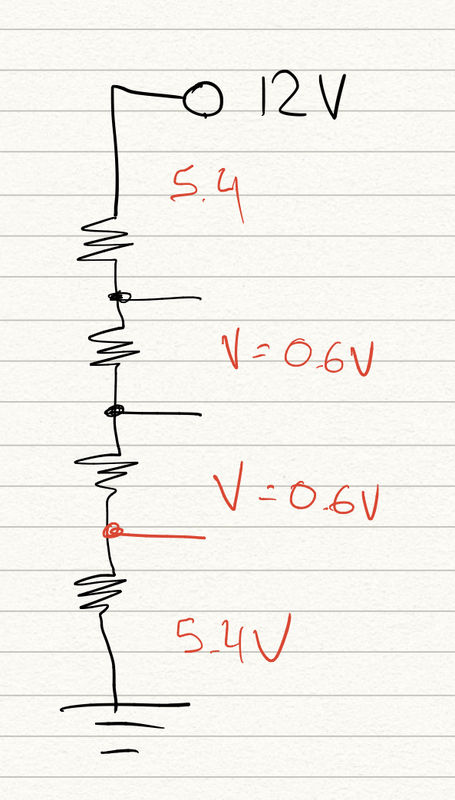 I know the basic theory behind voltage divider but I’m having trouble making it. Also, the solution has unlimited solutions so what are the best range of resistors to use? I will be powering an 8 ohm speaker with my amplifier. Thank you kindly. Browse other questions tagged voltage bjt or ask your own question. Why Does Op-Amp Output Voltage Always Saturate (in a Non-Inverting Amplifier Circuit)?